A Year of Reading: Word Game Wednesday! In the middle of the week, we break from our regular word study routines for Word Game Wednesday. 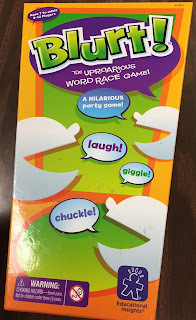 Over the course of many years, I have collected lots of word games. They never got played until I started Word Game Wednesday. 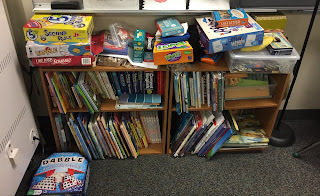 The games all live together on top of the shelves that have our word study/word play books and wordless books. 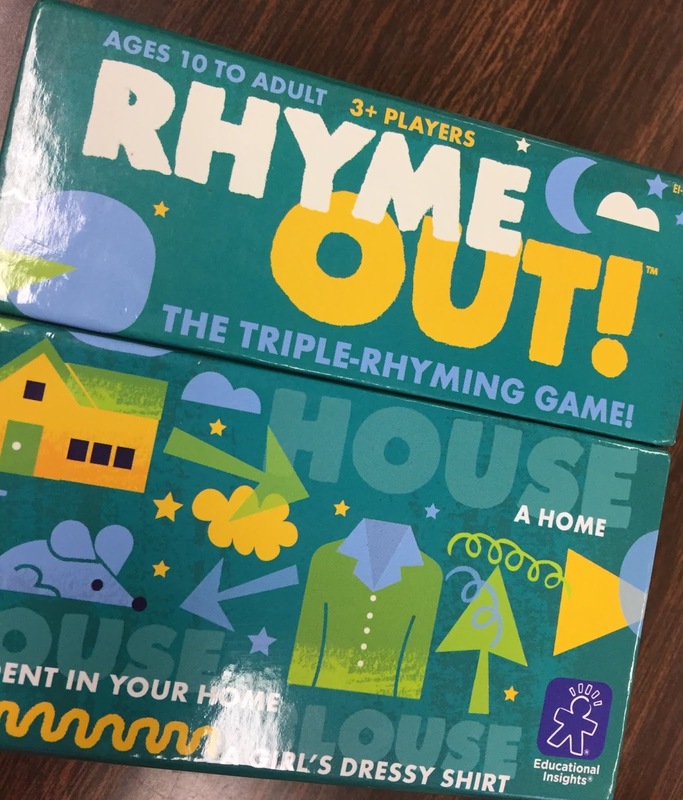 They are not available for indoor recess, only for Word Game Wednesday. That keeps them in better condition and a little more special. Some of the games date back to my childhood. I brought them from the game cupboard back home! I have sets of magnetic words and magnetic poetry for those who want to go "old school" on a cookie sheet! 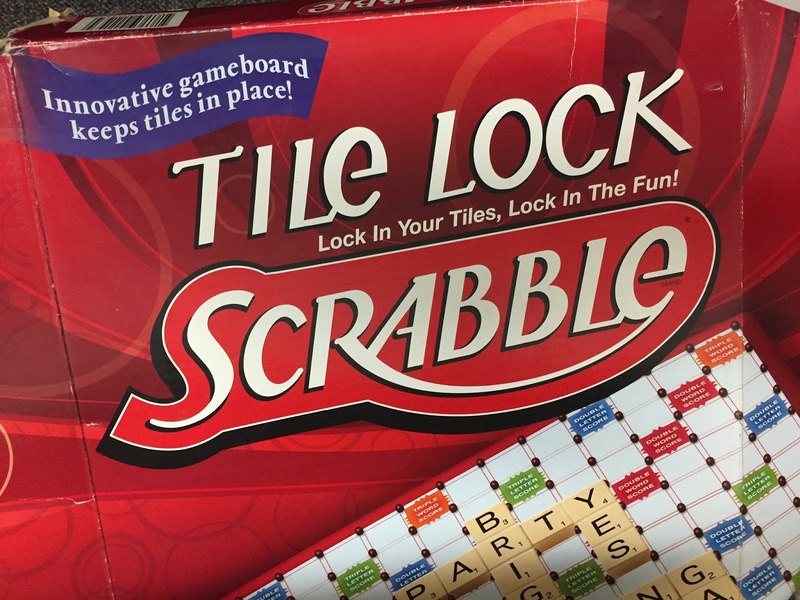 In addition to Tile Lock Scrabble, we have multiple boards and a big ziplock of letters. 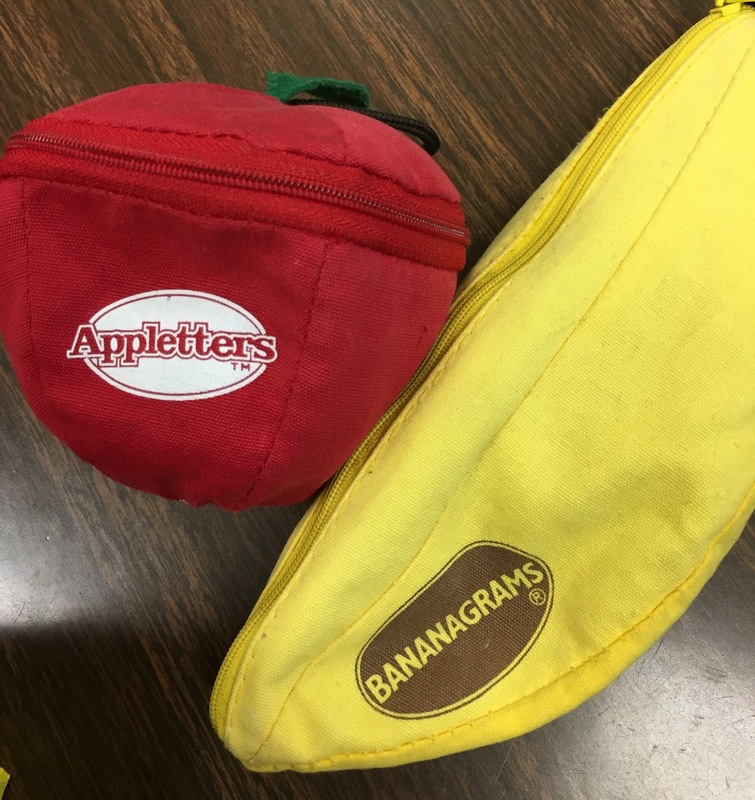 Appletters and Bananagrams are perennial favorites. Students build stories with Rory's Story Cubes or the StoryWorld cards. I have no idea where this came from! The students have made up their own rules. Red coins are consonants, green coins are vowels. Last Letter and After Words work basically the same way. In Last Letter, you have a hand of cards that have pictures on them. To start, you lay a card down and name something you can see in the pictures. If the starting word is "robot," then every player scans their cards for something in one of the pictures that starts with "T," the last letter of "robot." They name that thing on their card, putting it down on the pile. Then players have to find something in the pictures on their cards that starts with the last letter of that word, and so on. After Words has a board that shows the "last letter" currently in play. (It also has a timer, but ours has never worked.) The cards each player holds have categories, so if it's your turn and the last letter was "s," you might use your category card "weather" to play "snow." The game board marker would move to "w" and the next player would look at their categories for a word that starts with "w."
Tapple and 5 Second Rule (be sure you get the Jr. edition!) Are basically the same. Tapple has category cards, and when the first one is turned over, the red timer in the middle of the board is hit and the first player has a short amount of time to name something in that category. After they name it, they press down the letter it started with and reset the timer. The next players have to name something in that category with a letter that hasn't been used yet. If you can't think of something before the timer goes off, you're out. Last one still able to name things in that category wins. 5 Second Rule has a crazy "rain stick" 5 second timer that totally messes with your ability to name the item(s) in the category on the card that's drawn. Rhyme Out! and Blurt! can both get a little loud. (Who am I kidding? What with the timers going off and the spirited collaboration and competition, ALL of Word Game Wednesday can be a little loud. But it's all good!) 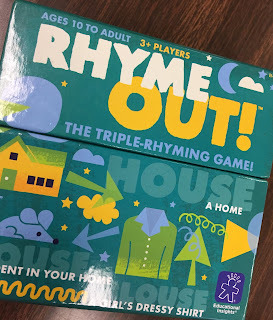 In Rhyme Out!, each card has a hint (such as "rhymes with snow") and the first player who can say all three answers to the clues wins the cards. The clues might be (and I'm totally making these up) "what you do when your nose is stuffy, what a plant does if you water it, and what the water in a river does." Blow, grow, flow! With Blurt!, a clue is read and the first person or team to blurt out the correct answer gets to move their maker around the board. Word Dominoes have pictures on the ends of the dominoes and I'm sure there are rules, but we usually just play by working together to try to match up two pictures that go together in a way, aiming to use all the dominoes to build the biggest chain possible. 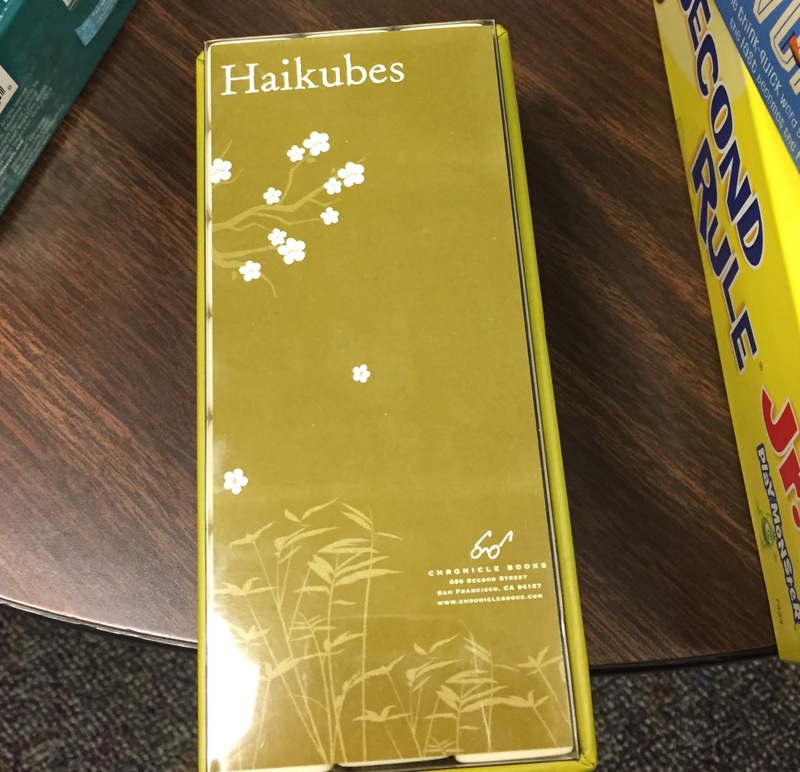 Haikubes haven't taken off yet, as you might imagine with all the other flashier/noisier options available! 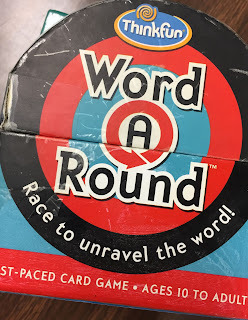 Word A Round has round cards with the letters for a short word in the blue inner circle, the letters for a medium word in the red middle circle, and the letters for a long word in the black outer circle. The backs of the cards are blue, red, or black so you know which ring to look at. 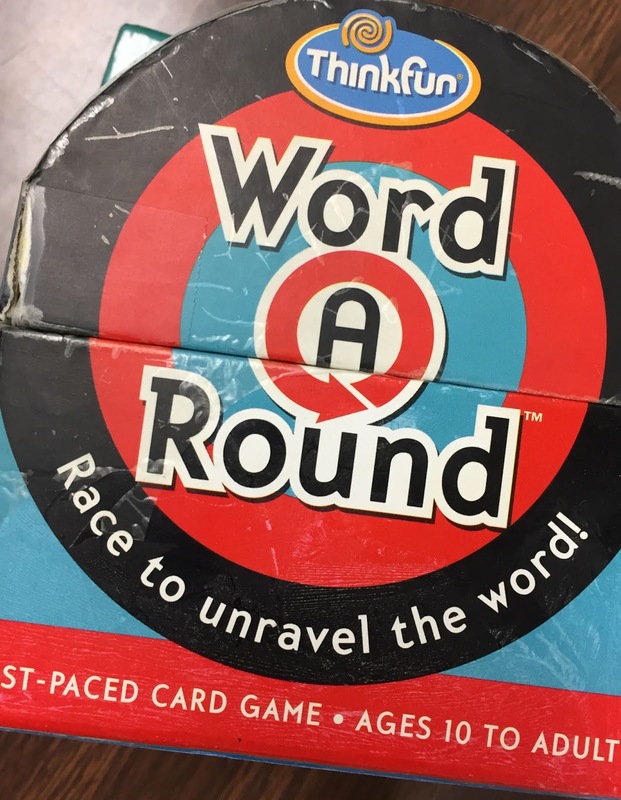 All the letters are in order for the word in that ring, but there are no clues that tell players where the word starts or stops or which way around the ring it is spelled. This game takes a good knowledge of prefixes, word endings, and common spelling patterns. 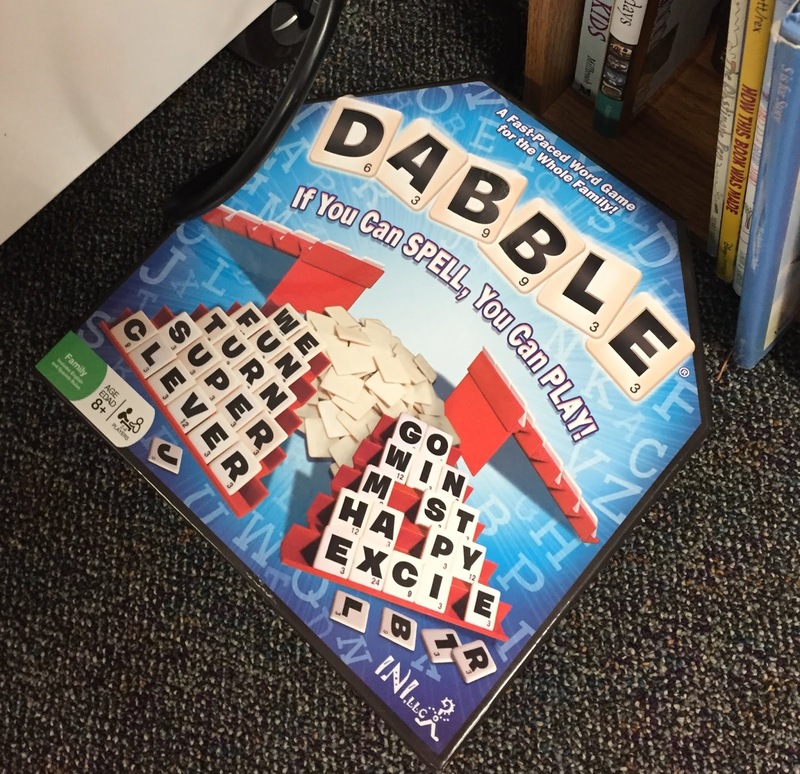 Dabble is a Scrabble-like game with a couple of twists. Each player gets 20 tiles and 2 minutes to make five words -- one each of 6-, 5-, 4-, 3-, and 2-letter words. If you make all five words in 2 minutes you get 25 points in addition to all the points on the letter tiles you used. We have one digital game -- Free Rice. You can imagine with all the other loud and active options, this one doesn't get chosen much. But most weeks there is at least one person who either gets shut out of their first choice or who wants a quieter, more solitary choice. A couple of last thoughts -- it doesn't make me very popular, but at least every other week I pull a small group to work on spelling patterns during this time. I make sure not to pull the same kids repeatedly. I've also started alternating Word Game Wednesday on Wednesdays and Thursdays so that the reading intervention kids who are pulled on Wednesdays don't miss it every week. As with any routine worth putting in place, you've got to make it work for you and your students. Aw, good old Free Rice. Thank you for this fabulous post with such great games and the message that loud can be productive. I also loved that the children have made up some of their own rules. 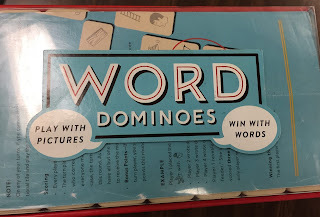 Looking for my own Word Game Wednesday collection to grow. Wow, I've hardly heard of ANY of these games! Thanks for an inspiring post! 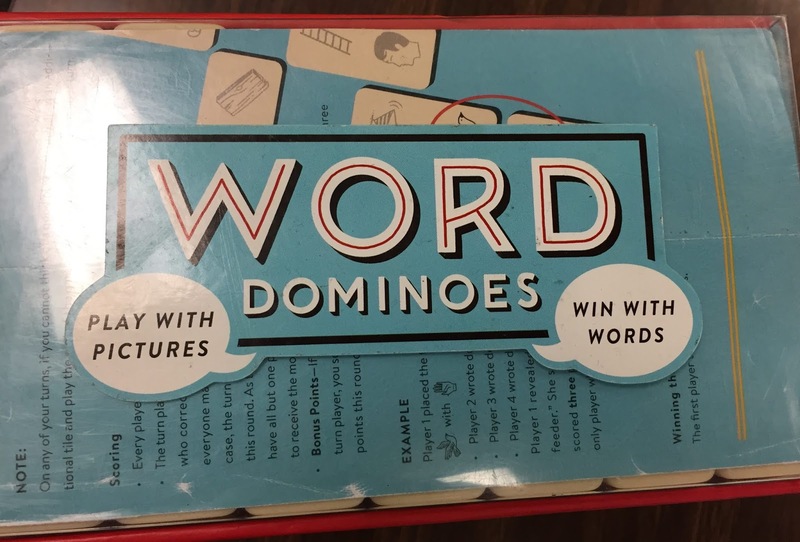 Not that you need any more choices for Word Game Wednesday, but just wanted to share a couple more word games. 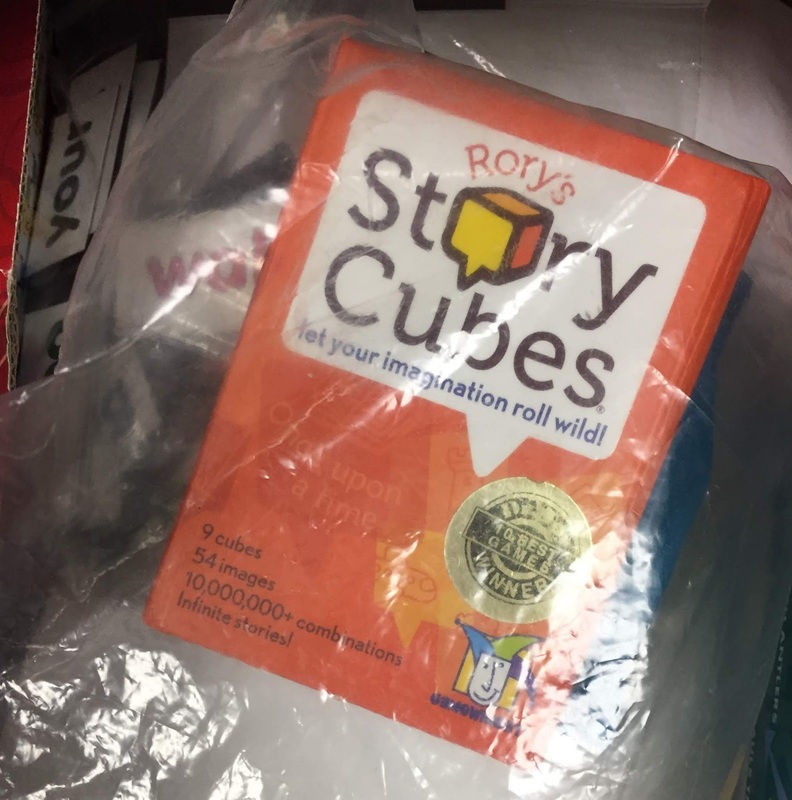 Thanks for sharing your idea and the resources you use, Mary Lee. Can I come play? Word games have always been my favorite -- and not all my friends are the same. That's partly why Poetry Friday is so fun for me. 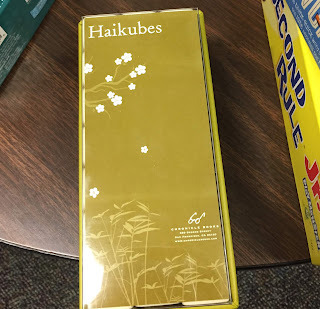 Now, hand over the haikubes. I’m ready to play—what an exciting day to look forward to! How fun - love these games! Great Games! Thanks for sharing!